For most of human history, we effortlessly consumed (nose-to-tail) the things we needed for strength, health and happiness. Like the fertile ground that we once walked upon, we were a natural extension of this earth. In the modern world, we unknowingly struggle to fulfill our nutritional needs in order to support and sustain a vibrant, disease-free life. Up to 12% of the U.S. adult population has heart disease. Heart disease remains the leading cause of death for both men and women. Whole food, nutrient dense organs and glands can provide great benefit for those seeking targeted support in harmony with nature — the old fashioned way, the way that our early ancestors did. 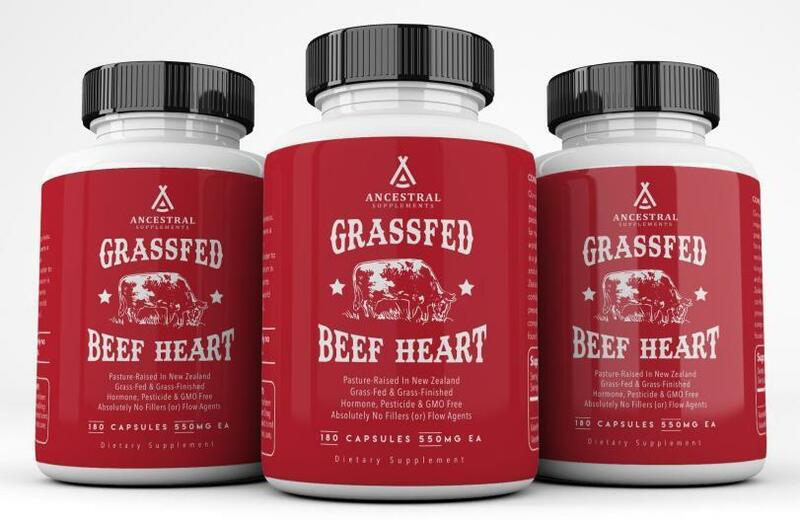 Grassfed Beef Heart is a whole food dietary supplement that provides 100% pure bovine heart as it exists in nature. This whole food is the richest source of CoQ10 and also provides proteins, peptides, cofactors and enzymes exclusively expressed in heart tissue which may strengthen and support one's own heart. * Our mission is our purpose... putting back in, what the modern world has left out. Traditional peoples, Native Americans and early ancestral healers believed that eating the organs from a healthy animal would strengthen and support the health of the corresponding organ of the individual. For instance, the traditional way of treating a person with a weak heart was to feed the person the heart of a healthy animal. Similarly, eating the kidneys of a healthy animal was believed to support urinary ailments and overall kidney health... Pancreas was fed to people with digestive problems... and spleen was fed to people with immune and blood deficiencies. Six capsules provides the equivalent of one ounce of fresh, raw whole bovine heart that you’d get from your local farmer (or) butcher. Our Grass Fed Beef Heart is a whole food dietary supplement that can be taken with (or) without food (even though it technically is food). The suggested use is 3 to 6 capsules a day which can be consumed all at once, or divided servings throughout the day. On the other hand, if you're looking for targeted organ support, you may be interested in our GRASS FED BEEF HEART to support heart health (or) our GRASS FED THYROID to support a struggling thyroid (or) our GRASS FED SPLEEN to support spleen and immune health *... you get the picture. We have a nose-to-tail product line that can be found on our "Products" page. If you can't find what you're looking for (or) you're not sure what you're looking for, send us an email and we'll do everything we can to help. Keep in mind that grass fed heart is the richest source of CoQ10 that exists in nature... that said, there's more to the story than "experts" recommending 100 to 200mg of exogenous CoQ10 per day. I hope that you will read this entire response so that you will know the importance of endogenous production and how to best support it in harmony with our biology. I promise you that it's worth the read. A six capsule serving of our Grass Fed Beef Heart will supply approximately 10mg of CoQ10... Six capsules provides the equivalent of one ounce of fresh, raw whole bovine heart that you’d get from your local farmer (or) butcher. That said, even if you consumed a plateful of grass fed heart, say 6 ounces, you'd be getting approximately 60 mg of CoQ10. Like I said, there's obviously more to the story when it comes to managing your CoQ10 status at the tissue level (hint, hint: endogenous production is pretty important here). There is really nothing that exists in "nature" that would have regularly supplied "supra physiological" amounts of CoQ10 that are found in many CoQ10 supplements today. In fact, research points to us requiring up to 500 mg per day of CoQ10. If the average CoQ10 content of the western diet is only 5 mg per day, then food contributes only about 1 percent of daily CoQ10 requirements — the balance comes from endogenous production (within the body). So how do we manage our CoQ10 status at the tissue level... in our hearts, and in our livers and in our brains (not just in our blood)... Eat traditional foods that contain high amounts of CoQ10 such as grass fed liver, grass fed heart and grass fed brain. Don't do this for the CoQ10 content... Do this because these foods provide the vitamin and mineral content to support endogenous production of CoQ10. In summary, the vitamin and mineral content of foods is therefore of greater importance for maintaining CoQ10 status than their CoQ10 content. Remember just how smart nature is... Most of the foods that contain significant amounts of CoQ10 are also rich in many of the nutrients required for CoQ10 synthesis (heart, liver and brain). These foods were prized by our early ancestors for a reason which is why their traditional diets included the frequent and nourishing consumption of nose-to-tail organ meats. Send me an email... reply to the comment... let me know your thoughts... let me know your questions. I'd love to hear from you. Once again, cut the carbs, increase healthy fats (bone marrow, egg yolks, ghee, wild fish) and lose more weight. Increase NO2 (nitric oxide) by eating more beets, more mid-day sun and perform a nitric oxide dump as seen here. Shut your mouth and perform deep diaphragmatic breathing. Slow breathing lowers blood pressure and enhances baroreflex sensitivity, a mechanism to control blood pressure via heart rate, in people with high blood pressure. This finding was so strong that researchers suggested slow breathing "appear[s] potentially beneficial in the management of hypertension." Google "Buteyko method" for more info. Connect to the earth daily, especially when blood pressure seems out of control... Perhaps buy a pair of grounding sheets. NOTE: Nitric oxide is a potent vasodilator, which means it causes your blood vessels to expand and dilate, promoting blood flow and lowering blood pressure. If high blood pressure is related to kidney health (or a rhabdo event), this is a must read Mercola article here. If situational high blood pressure is a recurrent issue, try slowing your respiratory rate to just six breaths per minute for a period of five minutes. This practice has been shown to significantly reduce blood pressure and result in a small reduction in resting heart rate. Are you on a calcium channel blocker (CCB)... is your body drawing calcium out of your bones and teeth to reach homeostasis in your blood and tissue... if so, consider consuming whole egg shells. Let me know if you need my recipe... my kids, wife and I take about 2 to 5 grams of egg shells daily and we also eat skin-on, bone-in sardines (along with wild fish eggs) on Wed and Sun. If you're not going to eat farm fresh liver, seared heart steak strips and/or homemade bone broth, consider our Grass Fed Lung (w/ Liver), our Grass Fed Bone Marrow and our Grass Fed Heart. These are fundamental to our physiology and provided the targeted support that many of our functional healthcare practitioners consider in their own practices. "High" cholesterol is a predictor of longevity.